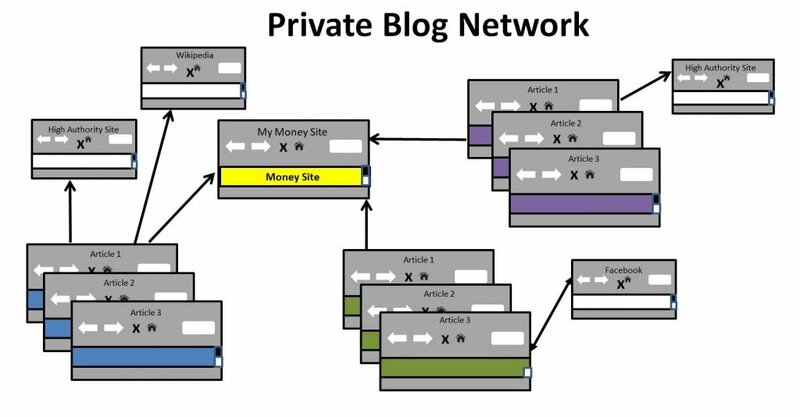 A private blog network (PBNs) is where a SEO creates a network of high domain authority sites for the purpose of directing backlinks to improve the ranking of a primary website (often called money site). Getting backlinks from a high authority site is one of the most effective strategies for improving a site’s ranking and therefore increasing traffic to the site. A Private Blog Network (PBN) is a grey hat/black hat backlink building strategy that Google sees as intentional link building. If discovered Google will deindex sites in a PBN. Despite this some SEOs create a private blog network (PBN) to make the process of link building more efficient and effective as it gives them total control over how to create backlinks. This is so valuable to an SEO they may see it as being worth the risk. PBNs enable SEOs to tweak the anchor text to allow the money site to rank on specific keywords and can decide exactly where the link is located in the content. To avoid detection SEOs will use white hat link building techniques alongside their PBN and will not use their PBN for sites with no backlinks. They will also drip feed backlinks to ensure they appear natural and their density does not arouse suspicion. A private blog network (PBN) normally comprises expired or deleted domains that have been purchased from domain auctions or brokers. SEOs look for domains that have high quality backlinks so that they can pass on their authority to the money site. SEOs will sometimes create private blog network (PBN) of over 1,000 sites to allow them to meet client demands to improve their site ranking and traffic volumes. How do private blog networks (PBNs) avoid detection? Use a variety of web hosting companies because many web hosts are only given a small range of IP addresses. Purchase domains from different registrars and ensure you have the WhoIs Guard enabled on most domains. Avoid spun content and ensue you post unique and good quality content to avoid creating suspicions from search engines. Focus on embedding links in contextual text and avoid site-wide links. Keep outgoing links to a maximum of 5 links per page and have no links on some pages. This will help make the link profile look natural and prevent a high link density which could be suspicious. Ensure all outbound links point to high authority sites that are relevant to your market. All initial links from your PBN sites should go to authoritative sites in your market and you should only begin to link to your money site after you have created a number of pages. Make sure you use different anchor text when creating a link to your money site. Never link out more than once to the money site from the same domain. Keep your PBN sites in the same market niche as it was before you purchased it. For more on PBNs see this Private Blog Network Guide from DomCop. A private blog network is a black hat technique and they require a lot of time and money to set up properly. However, for some SEOs the cost and risk is obviously worth it because it gives them so much control over backlink building. This can be a valuable resource for any SEO seeking to improve their client’s SEO ranking and domain authority.